Taiwanese IT product manufacturer - ASUS has announced yet another tablet under its flagship Fonepad series & this tablet is code named as Asus Fonepad 7. It is expected to hit the shelves by Q4 of 2013. Looking at the specifications it will be competing with the likes of Samsung Galaxy Tab 3, Micromax Tab P650, etc & if priced strategically this tablet will find many takers. 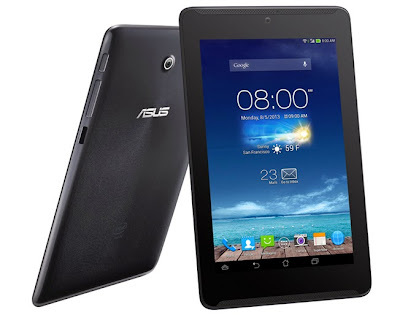 Asus Fonepad 7 sports a 7 Inch IPS LCD Capacitive touch screen with multi touch. Asus has packed in a WXGA display with a resolution of 800 x 1280 Pixels, ~216 ppi pixels density, 16 M Colours. Dimensionally Asus Fonepad 7 measures 120 x 196.5 x 10.5 mm (4.72 x 7.75 x 0.41 in), it weighs 340 gms (11.99 oz) & it will be available in two flavours Sapphire Black & Diamond White. This tablet from Asus is 3G ready with a slot for microSIM & supports Voice calling. The multimedia aspect of Asus Fonepad 7 features 3.5 mm Audio Jack & Loudspeaker. Under the hood this tablet holds a Dual Core 1.6 GHz Processor, Intel Atom Z2560 Chipset, PowerVR SGX544 MP2 GPU, 1 GB RAM. Technically this tablet is capable of multi tasking & gaming. The internal memory stuffed in this tablet comes in three variants viz; 8 GB / 16 GB / 32 GB. Asus has further packed in a microSD card slot with a support upto 32 GB microSD card. This tablet will come out of the box with Android OS v4.2 (Jelly Bean). The data connectivity aspect of Asus Fonepad 7 features Wifi, Wifi HotSpot, Bluetooth v3.0, microUSB v2.0. For positioning it has packed in GPS with support for A GPS & GLONASS. On the rear panel of Asus Fonepad 7 is a 5 MP Primary camera with autofocus, geo tagging. The lack of LED flash light will make the camera of this tablet useless in low light area. This Primary camera is capable of clicking images of 2592 x 1944 Pixels resolution & record HD videos of 1080 P @ 30 fps. On the front panel is a 1.2 MP Secondary camera for video chatting. Asus Fonepad 7 comes with a non removable Li-Po battery of 3950 mAh.